A round, chrome-plated light that can be used as a license plate, utility, or dash light. The light measures 1-1/2" in diameter by 2" long. This domed light has a chrome-plated top half; the bottom half is a white lens with a replaceable bulb. The light snaps into place with a 1-1/4" mounting hole. 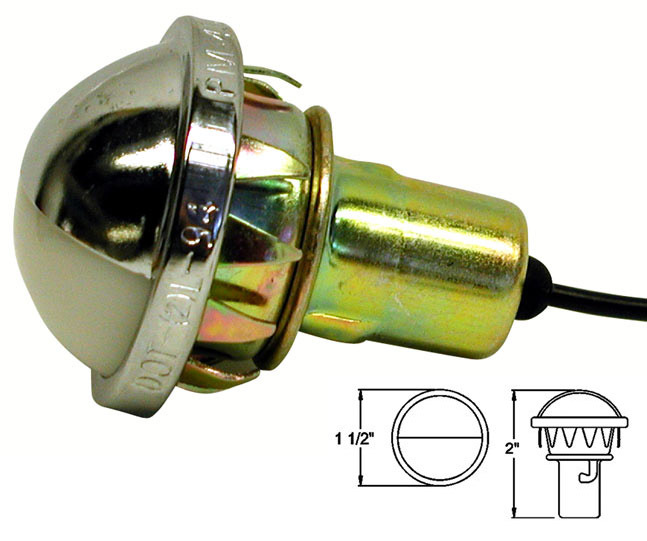 The light contains a single lead wire for power and is grounded through the mounting hardware. These innovative stainless steel headed custom lights look like, and perform the function of, standard bolts but have small 12-volt high-intensity LED lights inside that shine through letter-box slot for plate illumination. This is an license plate mini-light on an ear-mount base. The light measures 2-9/16" long x 1-3/16" wide x 15/16" deep. The light includes a gasket for a weathertight seal against the elements. 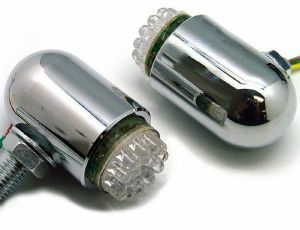 This light has a polished, chrome-plated housing. This light mounts on 2" centers. The two-wire design includes the lead and ground wires to mount to any surface. 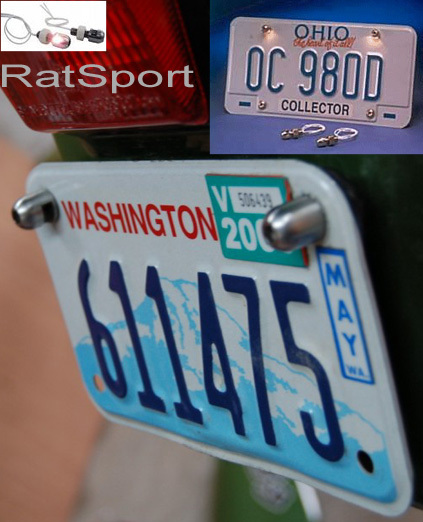 Mini license plate light features polished, chrome-plated housing. Mounting ears for surface mount. Design includes both lead and ground wires for mounting to all surfaces. Ive used a pair of white ones for reverse lamps and red for fog to good effect on my 64 Galaxie where their slim profile makes them unobtrusive. Small & bright 36w equivilent. Measure approx 85mm long by 30mm diameter. 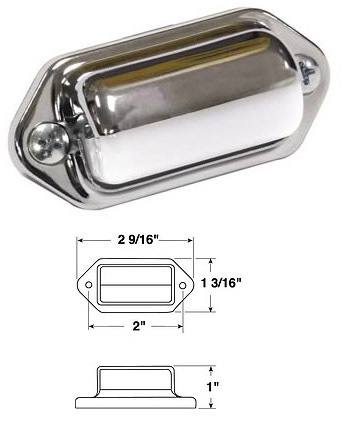 Chrome cover only for Lucas L467 (127916) plate lamp.